Today’s blog is going to bring us back to the swingin’ 60s, and early 70’s. The era of Tie-dye, The Rolling Stones, free love, and Richard Nixon, AUSTIN POWERS BABY! If that paints a picture for you, then you have a terrific start to understand where our kitchen fits in. Kitchen as it appeared in 2015 before renovation. Check out the wallpaper! Goldenrod counters, pine cabinets with horse bit hardware and strap hinges. The appliances were all Jenn-Air, there was a pop up blender that had every attachment you could imagine, including a daiquiri maker. Double ovens and even an indoor grill finished off the entire package. This kitchen was state of the art when it was put in, and had to have been the pride of the house. By the time we got it however, more than 40 years after its installation almost none of the appliances worked, the floor was lacking varnish, some wallpaper was missing (along with plaster) and the once elaborate built ins, that complimented the dining area were mostly missing. To put it bluntly, it was a mess. Exposed joists, and area where beam had to go in to support the house above. With some shrewd saving, and help from my parents, we were able to move forward with getting our dream kitchen moving in the spring of 2016. We hired a small local contractor with a keen eye, and ambition. Demolition began and the dust started. All of the dropped ceiling was removed to show the original plaster was damaged beyond saving, so all of the ceiling had to come down to the joists. About a 2 days into demolition our first big hiccup came along. When the kitchen had been renovated in the early 70’s they had removed a wall to make 2 rooms one large room. When they removed this wall, they did not re-inforce the floor above and the bedroom floors above had started to sag dangerously low. Making a tight budget even tighter we had to have a beam installed to jack up and support the sagging 200 year old floor/ceiling. Fortunately the house had been built like a bomb shelter and oak was used in all the joists and beams inside the brick walls. The quality of these materials had prevented failure of the structure (good old time craftsmanship at its best). Looking inside the ceiling also revealed that the house was put together in part without nails, one indication of the great age of the home. The floor was refinished to a gorgeous walnut, with a matte sheen to avoid the manufactured look. The fireplace mantle had been long discarded and hunting through salvage shops we found a great deal on a federal mantle in Frederick, Maryland. Custom metal surround was installed over the damaged brick on the face of the fireplace. A very realistic gas insert by White Mountain Hearth was installed in lieu of burning wood to avoid smoke damage, and in favor of cleanliness. 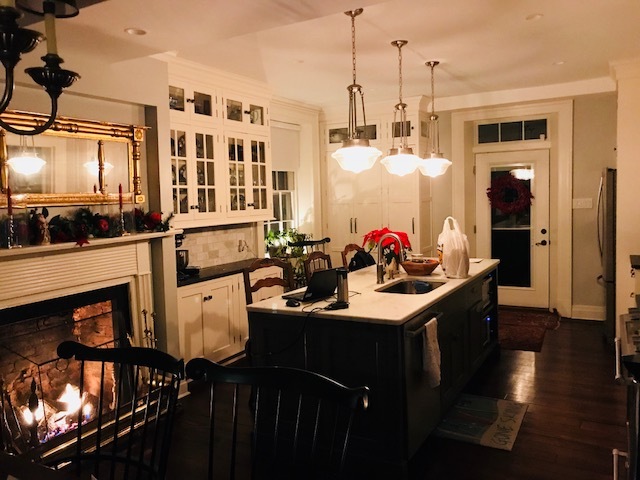 Four inch cans on dimmers were installed throughout the kitchen and 3 vintage style glass pendants were placed over the island. Kim Fox, our wonderful kitchen designer at Hagerstown Kitchens designed the cabinets and layout for us. Hagerstown Kitchens is a local cabinet shop that makes the product right in our area . Set of renderings of the initial kitchen design. The cabinets were chosen carefully in inset doors. This is more expensive than regular style doors, but gives a more authentic feel. Quartz was used on the large island, and honed granite on the surrounding counters. 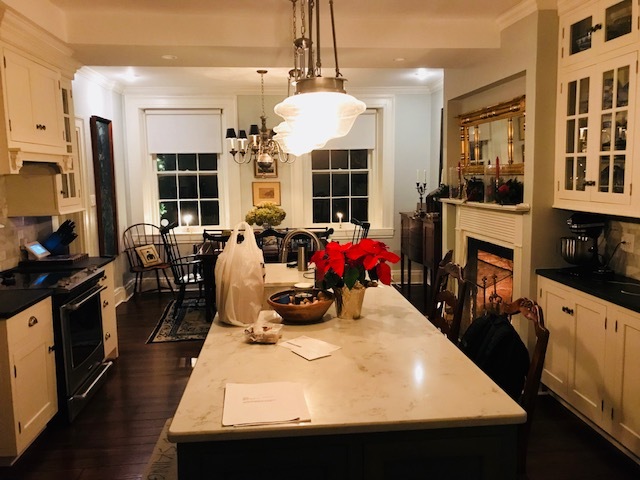 The cabinets were finished in Dover White, and the walls were painted in Sherwin-Williams historic Pearl Grey. Kitchen as it appears today, Grace by the new fireplace. After being given nearly a century old photograph of the house we noticed that the door from the driveway with stone steps was originally a window, and had been changed probably in the 1950s, so we put the window back, and had the door moved to the back of the kitchen that would give better access to the new back porch that was being built along the entire length of the main block overlooking the creek. The circa 1950s uneven stone steps and concrete patio were removed and seeded to return it to lawn. We interviewed a few contractors to add a new flagstone path to the newly installed deck and back door, but ultimately decided it was something we could tackle on our own, and with a brilliant stroke of luck, we started on what was to become the hottest day of the year with help from my sister Denise. It came out pretty good for a couple of first timers. Flagstone path installed by us with the help of my sister Denise. A vintage Art Deco Chinese rug found at auction, went under the farm table, and black/green Windsor chairs surrounded it. A Virginia Hepplewhite sideboard c.1800 finishes the eating area. We chose mid-century oil paintings to adorn the walls, and the juxtaposition with the antique furniture is stunning. While peeling back some of the old “groovy” wallpaper, we found signatures of workers that had hung some earlier wallpaper, a nod to the quality that previous owners had lavished on the house. Our contractor paid great detail to the woodwork that was missing or damaged, in this room. He replicated it with great skill, and most people do not even notice the difference between the new, and the 200 year old federal molding that remained. A very interesting design feature of our home are the incredibly thick brick walls (16 inches) and the deep window sills with 45 degree angle paneled moldings. About the time the kitchen was finished we had been researching former families and got in contact with a family that had owned the house for about 20 years and used it as a family retreat. These people had sold it to the people we bought it from. The lady that had owned it with her husband wanted to come back and bring her extended family for a visit. Grateful for allowing them to tour the house and grounds, they brought us an extraordinary gift. A german rifle made for the Napoleonic war around 1815 was found in the ground near the smoke house. At the dawn of the Civil War, the south found itself with a lack of weapons, most factories being in the north. European countries sold their old weaponry to the Confederate government where they subsequently fashioned them to weapons for their soldiers. Past owner viewing the newly constructed library, and the "Cool Hollow Musket"
The “Cool Hollow Musket” as it is called was one of these such weapons. Most likely left by a Confederate soldier that either stayed near the house or was treated there. Whatever the actual story is we will never know, but this wonderful treasure was an amazing gift that has come home. What we have come to realize is that our historic home, just like so many others is more than just the built environment. These structures encompass centuries of family life, both happy times and sad, war and peace. In this bloggers humble opinion, these are the most important aspects of owning an old house, we are keepers of the past, saving it for the future.